Quinoa, the protein-rich grain that served as a staple food in South America's ancient Incan empire, has finally caught on in North America. But most folks up here toss the tiny grains into savory stews or salads, such as Quinoa Salad with Lemon Dressing. Gretchen Noelle, of the Peruvian food blog Canela &amp; Comino, recently posted about quinoa's sweet side. Her quinoa flan combines quinoa, evaporated milk, eggs, condensed milk, vanilla extract, and sugar for a new take on a classic Latin American dessert. Helen McSweeney, from the food blog Tartelette, commented on Noelle's quinoa-flan post that she likes to eat quinoa every day as a hot cereal for breakfast. So does Deborah Madison, whose quinoa morning cereal incorporates dried apricots and pistachios. The grain is quick-cooking, making for a fast, hot breakfast. 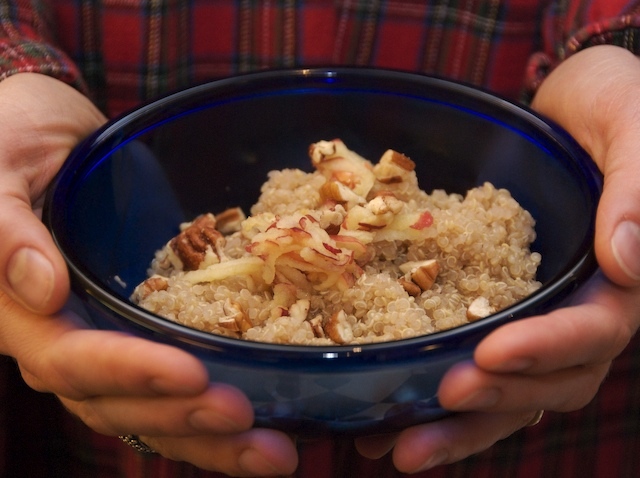 Like most contemporary cookbook authors, Noelle urges her readers to rinse quinoa before cooking it to remove the saponin, the grain's bitter-tasting natural coating. Keep in mind, however, that most commercially processed quinoa has been rinsed thoroughly enough to get rid of the saponin.